As Sony continues on its relentless quest to ensure every home in the world possesses a PlayStation 2, games like Sing Star will become ever more popular. 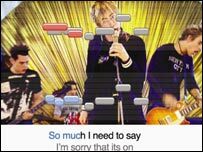 The premise of Sing Star is simple - it is a karaoke-inspired title which awards points to players who can sing in tune. The game comes with two microphones and a game disc, featuring about 30 songs and music videos. Players can sing solo, duet and even battle it out to find the most tuneful. Two players can warble simultaneously in a head to head battle - the game tracks the players performances with live comments such as "awful" and "cool". If being told by a games console that you are tone deaf is not enough humiliation - you can always playback your performance to hear the dreadful rendition yourself. The premise is wrapped in a simple-to-use interface, which reflects the young teen audience at which the game is squarely aimed. It is simple and addictive fun, which a late night session with three friends can attest to. The songs range from recent chart hits such as Jamelia's Superstar to pop classics such as Like A Virgin and A-ha's Take on Me and all-time classics such as Elvis' Suspicious Minds. The original music videos for each of the tracks plays in the background as you sing. If you own one of Sony's Eye Toy cameras then you can also watch yourself in action as you perform. On the downside, the game's 30 tracks is a severe limitation and players will quickly get bored of the offerings. The number of game modes is also particularly limited and perhaps more thought could have gone into the variety of challenges. Despite this, the game represents good value at £39.99 including two microphones. I can only hope that Sony release another disc of songs to increase the longevity of the title. Nintendo wants to revolutionise gaming but does the novelty wear off quickly?